The Grid lets you lay out pages quickly and easily in a natural, logical way. The Gumby Framework’s grid system can be customized and molded to fit your every need — it’s easily adapted to any screen size or application. The possibilities are endless; the results are extraordinary. Inside of the framework, we’ve packaged up tons of styles and common interface elements to help you quickly put together functional prototypes. Toss together some quick layouts using the included forms, buttons, tabs, and pure CSS dropdowns — then customize away! 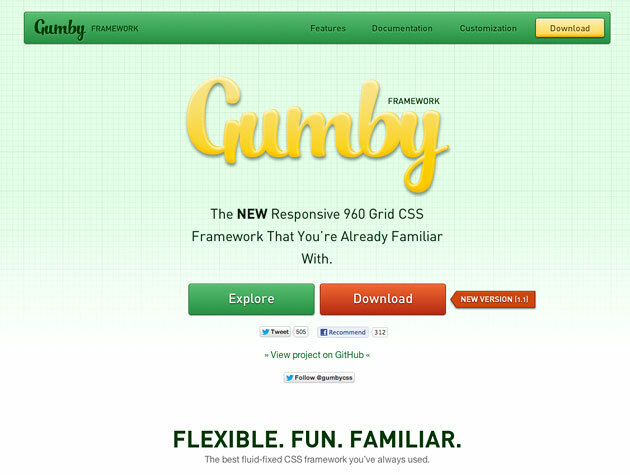 The Grids built into Gumby Framework let you quickly put together page layouts for mobile devices and the desktop. You don’t need two different sites — create a rock-solid experience on all kinds of devices with the exact same markup. From iPods to IMAX, build great experiences that fit any screen. Support for all of the new HTML5 elements, structure, and syntax. Keep your projects on the cutting edge of web design style for years to come. Wireframe responsive sites just like you would a fixed grid layout. Customize your package based on your needs. Cut the fat, savor the meat.